media conveyed such as wet steam or abrasive particles. External abrasion is the damage to the hose assembly caused by being rubbed on a foreign object. Surrounding conditions such as pressure, corrosion or temperature to which the hose assembly is exposed. The distance a hose assembly deflects laterally to one side from its installed position. from centerline of the hose. longitudinal axis of the hose. to protect it from physical damage and/or to limit the bending radius. The method of fixing end fittings to flexible metal hose, i.e. welding, brazing, soldering, swaging, bonding or mechanical. Compression or extension movement along the longitudinal axis of the pipeline. Strands of wire are alternately crossed two over and two under. Angle formed by the braid strands and the longitudinal axis of the hose. designed braid coverage will balance pressure capability with flexing requirements. Minimization of braid wear on the crown of the corrugation is also provided by optimal braid coverage. Motion between the braid and corrugated hose normally causes wear on the crown or OD of the corrugation and the inside diameter of the braid. together prior to the manufacture of the braid. Braided braid is primarily used on larger diameter hose assemblies. parent metals to be joined. Regular cyclic motion at a slow cyclic rate and constant travel. The dynamic minimum centerline bend radius must be doubled on constant flexing applications. The chemical or electro-chemical attack of a media upon a hose assembly. Annular or helical flexing member in corrugated metal hose. The number of cycles a hose is flexed before failure. Movement from neutral to extreme position and then returning to the neutral position. Force to laterally deflect the hose assembly a specific distance from the neutral position with one end fixed and the other end in motion. Strands of wire alternately cross one over and one under. Two hose assemblies joined by a common elbow to permit movement in multiple planes. Non-destructive test method for detecting surface defects. Non-continuous or intermittent controlled motion such as the result of thermal expansion. Jacketed or Duplex hose assembly is a hose within a hose. Both inner and outer hoses act independently as separate pressure carriers. Cross-sectional area defined by the mean diameter of the hose. Damage of the hose assembly due to excessive flexing of the corrugations. second or pounds per hour. The rate of vibration or flexure of a hose in a given time period such as cycles per second (CPS), cycles per minute (CPM) or cycles per day (CPD). an electrolyte such as water, sulfuric acid or sodium chloride solution. Hose corrugation formed in tubing to resemble a continuous spiral or screw thread. Used to provide additional protection against abrasion. Metal hoses can be supplied with an external round or oval section wire spiral. The diameter inside of the hose corrugation measured at the closest point either side of centerline of the hose. requirements for design, manufacture and testing of corrugated metal hose and hose assemblies. This motion occurs when the hose centerline is moved in a plane perpendicular to the longitudinal axis with the end remaining parallel. also helps to reduce internal abrasion. The assembly is installed in a loop or U shape and is most often used when frequent and/or large amounts of motion are involved. The substance(s) transfered through a system. The smallest radius to which a hose can be bent without permanent deformation of the corrugations. The pressure, temperature, motion and environment to which a hose assembly is subjected. The external diameter of a metal hose measured at the top of the corrugation or braiding. The percentage of wall thickness of the two parts to be joined that is fused into the weld pool in making a joint. A fixed radius bend in a hose assembly used to compensate for misalignment. The distance between the two peaks of adjacent corrugation or convolution. The number of individual thicknesses of metal used in the construction of a wall of the convoluted hose. Usually expressed in pounds per square inch gauge or psig. A total pressure measurement system in which atmospheric pressure at sea level is added to the gauge pressure and expressed as psia. The pressure of the atmosphere at sea level which is 14.7 psig or 29.92 inches of mercury. Amount of pressure determined through testing required to cause a rupture in the hose wall. The average amount of pressure, at ambient temperature, at which the core or braid can be expected to rupture. The pressure at which the convolutions of a hose become permanently deformed. Often used to express system pressure in terms of water column height. A column of water 1 foot high exerts a .434 psi at its base. Maximum pressure that the hose should be subjected to on a continuous basis. A rapid change in the pressure above and below the normal base pressure usually associated with reciprocating type pumps. Pulsating pressure can cause excessive wear between the braid and the top or crown of the hose corrugation. A sudden increase of pressure in a hydraulic or pneumatic system that produces a shock wave. This shock can cause severe permanent deformation of the corrugations in a hose as well as rapid damage of the assembly due to metal fatigue. The internal or external pressure imposed on a hose during operating conditions. The uncontrolled motion of a metal hose such as motion that occurs during manual handling. A short interlocked casing or spring guard used to restrict bending at the end of the hose. The relationship or ratio of maximum working pressure to nominal burst pressure. An oxide or thin coating of media in/on a hose assembly brought about by surface conditions or welding. A method of joining two sections of hose. Damage to the hose when it is deformed into an “S” or “U” bend as the result of excessive internal pressure being applied to unbraided corrugated hose while its ends are restrained, or in a braided corrugated hose that has been axially compressed. Individual groups of wire in a braid. A form of corrosion in stainless steel normally associated with chlorides. The factor that corrects the pressure rating in elevated temperature applications. 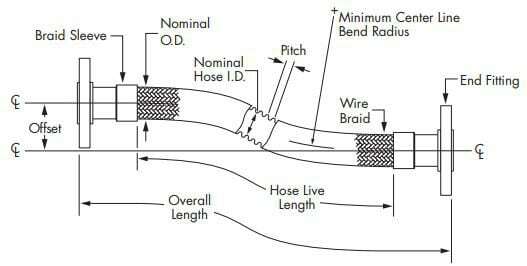 General classification of bending wherein the hose is installed to a U-shaped configuration. An application wherein the radius remains constant and one end of the hose moves parallel to the other end. A condition wherein a hose is installed in a U-shaped configuration and the ends move perpendicular to each other so as to enlarge or decrease the width of the loop. assembly while the other end is fixed. Negative pressure or suction usually expressed as inches of mercury. The speed at which the medium flows through the hose. Vibration of corrugations due to the buffeting of a high velocity gas or liquid flow. The process of localized joining of two or more metallic components by means of heating their surfaces to a state of fusion or by fusion with the use of additional filler material.